Finally today was the day that Sidney was going to propose to Carrie in front of his teammates and just about everyone who was involved with the Pittsburgh Penguins. Sidney had worked out with Mario and Natalie that Carrie would bring the twins to the Lemieux's house and then Natalie would get Carrie to Mellon arena. Sidney had told Carrie that the team decided that it would be fun to have wives, girlfriends, children and other family members come to the last practice of training camp for a get together. Sidney was getting help from his teammates so that his big moment would go off without a problem. Jordan and Marc Andre noticed that Sidney was sitting with his face in his hands. "Man he is seriously nervous about his proposal. I know that Carrie is going to say 'yes' so he shouldn't be that worried" Marc Andre said to Jordan. "Yeah I know" Jordan said looking over at Sidney. "I am going to talk to him" Marc Andre said as he walked over to Sidney. Sidney was sitting trying to relax but here he was getting ready to ask Carrie something huge but deep down he knew she love him and would say 'yes' but then again you never know. "Hey Sid dude you need to relax or you are going to explode and I don't think that would be a great idea right now" joked Marc Andre as he sat down next to Sidney. "I am trying to relax because I know Carrie will say 'yes' but then again" Sidney said as he messed with his tie. "Chill out ok because Carrie is going to say 'yes' and you two will be happy and have the perfect life" smiled Marc Andre. "Thanks Marc" Sidney said as he stood up and started pacing around the locker room. "Good lord Sidney chill out!" shouted Marc Andre. "Sorry this is like a huge step for me and Carrie." "So was the fact that you became a dad of twins and everything is going well with that right, Sidney?" "Yes" Sidney said as he stopped pacing and then looked over at the door out to the ice where Mario came walking into the locker room. "Hey Sidney, Carrie and Natalie are here and everything is ready. Are you ready?" asked Mario as he walked over to Sidney and patted his back. 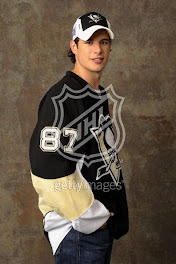 "Yeah I guess so" Sidney said as he checked his pocket and took out the ring to look at it one more time. "Wow Sidney that ring is beautiful and if Carrie does not say 'yes' then I will so marry you" laughed Marc Andre as he put his arm around Sidney's shoulders. That got a laugh out of Sidney and Marc Andre and Mario agreed that everything would be fine. The three of them headed out of the locker room and headed to the ice. When Sidney got out and onto the ice he saw Carrie looking amazing and then she looked over at Sidney with a confused look on her face. He walked over to her and smiled. "Hey Crosby what's going on here. I am the only girlfriend here except for Natalie and she said I had to look amazing and so now I am confused" Carrie whispered as Sidney stood near her and she only called him by his last name when she was not happy with him so he knew she was confused and slightly annoyed at him. "I have something pretty important to ask you and so just bear with me for a few minutes, Carrie" Sidney whispered back. Sidney took Carrie's hand and they walked over to be in front of everybody and Carrie was still wondering what on earth was going on here and then Sidney started to speak. "Carrie I know that I brought you here under false pretenses but I have a legitimate reason for doing what I did" Sidney said as he got down on one knee, "Carrie Addison will you do me the honor of becoming my wife. Will you marry me?" Carrie looked down at the ring that Sidney was holding and she had tears in her eyes and then she said, "Yes Sidney I will marry you. I love you." Sidney put the ring on her finger and then kissed her. There were hoots and hollers from all his teammates. Everyone congratulated Sidney and Carrie and there ended up being a party on center ice that late afternoon.